accompanying remote control. The credit card shaped remote control gives you access to the extensive menu of the photo frame. The photo, music or video data is in a very easy way controlled by the remote controller. 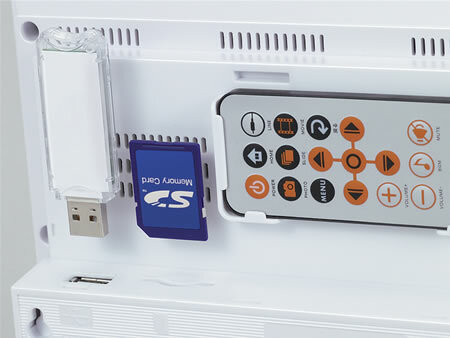 When not in use, the remote control can be easily placed on the rear of the photo frame.The frame with built-in memory of 128MB accepts SD memory card up to 2GB and built in USB terminal for USB flash drives. 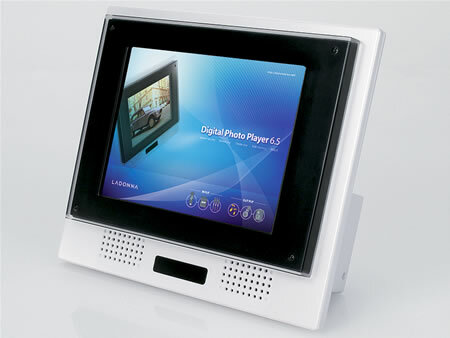 The Digital Photo Frame enables you to show pictures accompanied by music or even videos. The wall mountable King Jim digital photo frame DP01-65-WH measures 200×73×170mm, weighs approximately 1.2kg. (Without memory) and will be available from February 23rd for approximately 31,290 Yen (USD260).